How fun is that?! I'm excited to see the card submissions for this one! I hope all of you will play along. Remember, in order to be included in the random drawing, you must use a MelJen's Designs image on your project. I live in the USA! And our flag is red, white and blue. I decided to re-visit a card I previously created, featuring American Angel. I think she's adorable. After printing a few of the image, I colored her with Copic markers. Then I did a bit of fussy cutting on her wings, the stars and flag. I adhered them with dimensional adhesive and I also added glitter to her wings. I wanted this to look vintage, so I sponged on some distress inks. I just love this patterned paper pack. I don't use it often enough. It's from My Mind's Eye and it's called Kraft Funday Happy Days. I've had it for a while. The papers are all Kraft with a lot of fun patterns. Anywho...I loved the stars and thought they made a nice back drop for my image. Please stop by the Design Team blog to see what the other members have created to share with you. Many of our team members are from other countries, so it will be fun looking at their creations. And after taking in all that inspiration, grab your favorite MelJen's digi and join the challenge! You just might win some FREE digital stamps. Your card is so cute. I love the Kraft paper. Happy 4th of July, Barb! Hi Barb! I've been out of town and am just starting to catch up on my blog reading. I had to pop in and tell you what a wonderful job you did on this card. Love your patriotic angel with all its glittery sparkliness! Love the dimension you've achieved as well. Fabulous work my friend!! 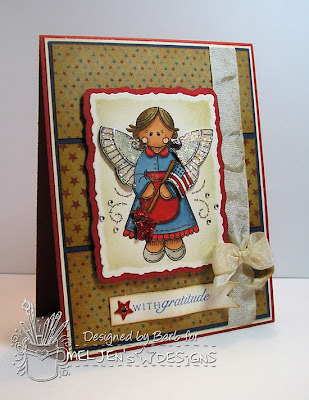 Gorgeous card Barb, the angel is so cute and you've coloured it beautifully.